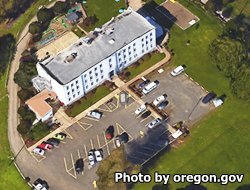 Mill Creek Correctional Facility is a minimum security prison that is considered a minimum security work camp, and is located in Salem Oregon. The capacity of this prison is around 300 adult male inmates. All inmates at Mill Creek Correctional Facility are provided medical, dental and mental health services on site. Offenders at Mill Creek Correctional Facility provide a labor work force for many state agencies as well as private industries in the surrounding area. All inmates who are incarcerated at Mill Creek Correctional Facility are expected to work. Offenders are encouraged to take adult basic education courses or work towards obtaining a GED if they do not possess a high school diploma. Inmates who are nearing their discharge date and are within 120 days of release can elect to participate in re-entry programing that helps prepare the inmate for release. Inmates can receive visits on Fridays, Saturdays, Sundays and Holidays only if it does not interfere with their work schedule. Mill Creek Correctional Facility utilizes a rotating schedule that is based on the inmate's dormitory assignment, because of this you will need to contact the facility for the current rotation. Visiting on Saturdays and Sundays occurs 7:30am-10am and 12:30pm-3:15pm. Friday visitation occurs from 12:30pm -3:15pm and from 6:30pm-8:30pm and alternates between A and B dorm. Holiday visits occur from 7:30am-10am, and from 1pm-3:30pm. To view the current visiting schedule at Mill Creek Correctional Facility click here.